I went to Target this weekend for a car charger and came out with a carpet runner, space-saving hangers, and a cart full of other things. Does this happen to anyone else? I swear Target is like a black hole…in a good way. You always get sucked in and never know what you’ll end up finding. 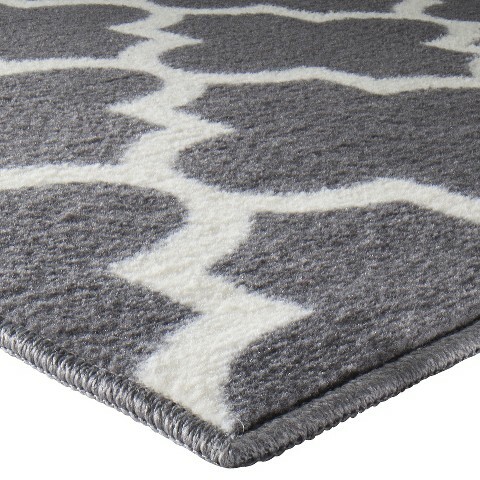 I was walking by the home decor section and these beautiful gray rugs caught my eye. I never considered myself a fan of the Moroccan print but I couldn’t resist these. At first I was only going to buy the runner for under the front legs of the living room couch. I ended up circling back around for the smaller area rug because I knew I wanted to do something with it and create a cohesive look in our front room.These turned out to be the perfect addition! They also happen to match a set of fabric storage bins I found at Marshall’s so there really is cohesiveness now. What gems have you found lately?